Ammunition in removable magazine Energy of fired cartridge causes the gun to load a new cartridge. Just pulling trigger fires gun until it is out of ammunition. Fires single round in the chamber then requires reloading Usually used for hunting. Caution! If this procedure is performed incompletely or in the wrong order, a cartridge could remain in the chamber and the gun could still be loaded! 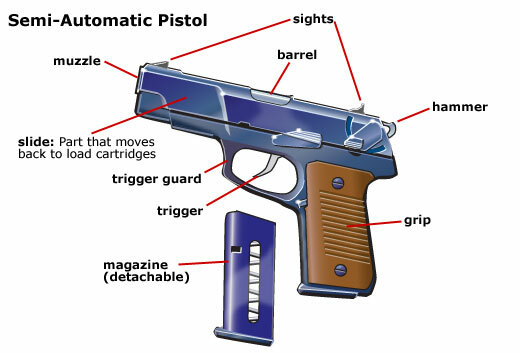 Semi-Automatic Pistols contain cartridges in two locations: the barrel’s chamber and a detachable magazine. If a user does not follow the correct sequence when unloading a semi-auto pistol, a cartridge may remain in the chamber even when the magazine is removed. To unload a semi-auto pistol, perform the following actions. 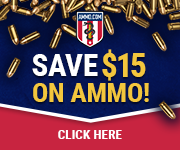 Remember to keep the pistol pointed in a safe direction with your finger outside the trigger guard. 1. Press the magazine release and remove the magazine. (The magazine release is usually just behind the trigger guard, although a few pistols locate this at the bottom of the magazine.) Set the magazine aside. A pistol is not unloaded just because the magazine is removed. Ammunition may be in the chamber, ready to fire. 2. Pull the slide to the rear while keeping your hand away from the ejection port. Lock the slide to the rear using the slide stop. 3. Visually and physically examine the chamber of the barrel for the presence of a cartridge. If a round was in the chamber, it should have been extracted from the chamber and ejected from the gun. Look into the chamber. Feel that the magazine has been removed and the chamber is empty. Safe gun handling is an attitude.  You should be aware of all safe gun handling rules and procedures. 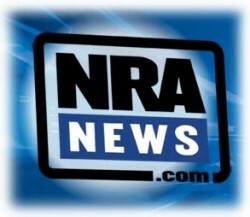 I will do a piece on safe gun handling for revolvers in the near future. Safe gun handling is everyone’s responsibility. If you see someone handling a gun unsafely explain to them why they should do it properly. Let’s make Safe Gun Handling an attitude. Don’t handle guns without an attitude towards safe gun handling.